How to make a Wedding Guest Tracker in Excel? An easy way to create your spreadsheet is by downloading this example Wedding Guest Tracker Excel spreadsheet template now! Tracking all of the responses from your invited wedding guests can be quite a nightmare! Don't worry! 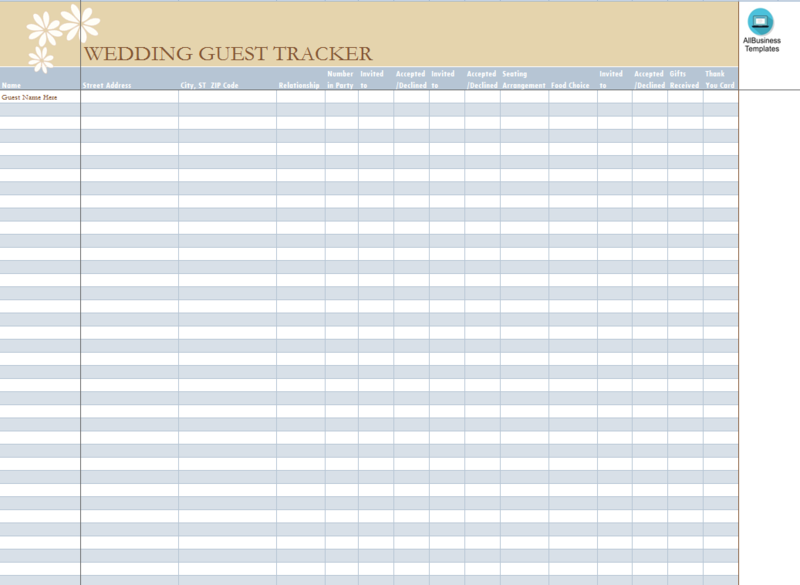 Here we provide a wedding guestlist tracker template for you! Use this wedding guest list template to track each guest's name, address, relationship, number in party, shower, ceremony and reception RSVPs, food choice, gifts received, and thank you note sent. Any occasion or function that we arrange, we first need a list of guest, a list of things to be done and so on so that the things are organized in prior in a well mannered way. With the wedding guest list in hand you can be sure that you have invited each and every guest and have not missed out anybody. It is also advantageous to hold the lists of guest because you can keep on adding people once they come to your memory, therefore making it clear, lists of people whom you have invited and list of people who are remaining to be called for the party. In the same lists you can also add a column of people who have confirmed arriving and so on. This Excel template is a great way to increase your productivity and performance. It gives you access to do remarkable new things with Excel, even if you only have a basic understanding of working with formula’s and spreadsheets. If time or quality is of the essence, this ready-made presentation can certainly help you out! Just download this file directly to your computer, open it, modify it, save it as a PDF or print it directly. You will see that finishing such a Excel spreadsheet has never been easier! Download this Wedding Guest Tracker Excel spreadsheet now!